Team Penske’s Will Power laid down the fastest lap in Portland on Friday. 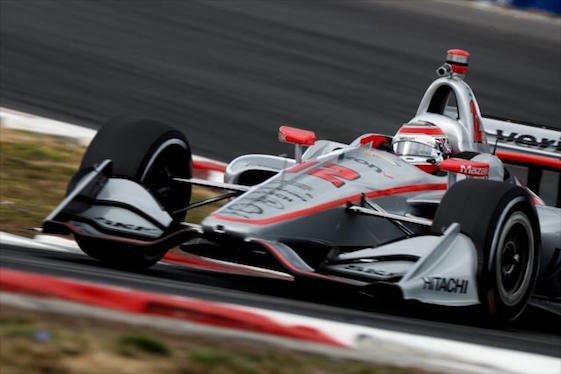 Team Penske’s Will Power continued to prove he’s serious about climbing back into Verizon IndyCar Series title contention Friday by posting the fastest lap of the second practice session at Portland International Raceway in Oregon. The winner of last week’s oval-track event at Gateway Motorsports Park turned a lap of 57.4053-seconds/123.166 mph in the No. 12 Team Penske Chevrolet to best the field of 25 entrants. Power will head to Saturday’s qualifications seeking his fourth pole of the season and 54th of his career. Power stands third in the season standings, 68 points behind four-time series champion Scott Dixon of Chip Ganassi Racing. Alexander Rossi of Andretti Autosport is second, 26 points out of the lead. Power’s first weekend goal is to qualify ahead of Dixon and Rossi. The reigning Indianapolis 500 champion also believes he must repeat that result in Sunday’s Grand Prix of Portland (2:30 p.m. EDT, NBC Sports Network). Power has let championship opportunities slip away in 2010, 2011 and 2012, finishing second after leading the points chase late. This year’s title will be decided Sept. 16 at Sonoma (Calif.) Raceway. Sebastien Bourdais posted Friday’s fastest lap at 57.3975-seconds, a pace of 123.183 mph set in the morning practice. The driver of the pink No. 18 Honda for Dale Coyne Racing with Vasser-Sullivan is the only entrant to have won an Indy car race on PIR’s 1.964-mile/12-turn permanent road-course. The Frenchman won Champ Car World Series races in 2004 and 2007. Friday’s hour-long afternoon practice was considerably warmer with the track baked in sun, but Bourdais also called it “a disjointed session” due to red flags for off-track excursions involving 2017 Indy 500 winner Takuma Sato of Rahal Letterman Lanigan Racing and 2016 series champ Simon Pagenaud of Team Penske separately sliding into the tire barrier at Turn 12. Marco Andretti of Andretti Sport recorded the fourth-fastest lap in the morning practice and was second in the afternoon (57.4668-seconds/123.035 mph). Overall, his time was fourth in the No. 98 MilitaryToMotosports.com/Curb Honda. In all, six drivers turned laps quicker than the late Justin Wilson’s official track record, a lap of 57.597-seconds set in qualifying in 2005. One of those drivers was series rookie Santino Ferrucci, a test/reserve driver for American-owned Haas F1 Team competing in just his third race, all for Dale Coyne Racing. Ferrucci drove in both ends of the Detroit Grand Prix doubleheader in June, finishing 22nd and 20th, respectively. Ferrucci lapped Friday at 57.4818-seconds/123.002 mph. “I can’t thank Dale (Coyne) enough for giving me this opportunity,” Ferrucci said. “The team has done a great job preparing the No. 39 Honda. They’ve been working really hard the past couple of weeks because it’s been back-to-back-to-back. I’m very happy with how today went. We were really quick on the Firestone red (alternate) tires, but on the blacks (Firestone primary tires), there’s still some work to do. Qualifying is scheduled Saturday at 6:20 p.m. (EDT). All sessions will stream live on RaceControl.IndyCar.com, youtube.com/indycar and the INDYCAR Mobile app. A same-day qualifying telecast will air at 7:30 p.m. Saturday on NBCSN. Schmidt Peterson Motorsports driver Robert Wickens was transferred to IU Health Methodist Hospital in Indianapolis Thursday to continue treatment of injuries sustained in a multiple-car crash Aug. 19 at Pocono Raceway. A Verizon IndyCar Series rookie, Wickens is expected to undergo further surgery on his lower extremities soon. Wickens had been in the care of Lehigh Valley Hospital-Cedar Crest in Allentown, Pa., since the incident. The 29-year-old Canadian sustained injuries to his right arm, both legs and spine. Surgeries were conducted on all three areas during his stay in Allentown. Patricio O’Ward took another step toward securing his first Indy Lights championship by winning the pole for the weekend’s first race at PIR, set for Saturday at 5:05 p.m. (EDT). O’Ward’s lap of 1-minute, 2.8074-seconds bested Andretti Autosport teammate Colton Herta’s 1:03.1808-seconds. Soon-to-be-champion Rinus VeeKay won the pole for the weekend’s first Pro Mazda race (Saturday, 7:50 p.m. EDT). His lap was just 0.0895-seconds better than fellow-rookie Oliver Askew. Kyle Kirkwood, who has secured the USF2000 championship, led qualifying at 1:10.9581-seconds. The weekend’s first race is set for Saturday at 4:10 p.m.
Verizon IndyCar Series point standings: 1, Scott Dixon, Chip Ganassi Racing, 568; 2,Alexander Rossi, Andretti Autosport, 542; 3, Will Power, Team Penske, 500; 4, Josef Newgarden, Team Penske, 490; 5, Ryan Hunter-Reay, Andretti Autosport, 421; 6, Simon Pagenaud, Team Penske, 400; 7, Robert Wickens, Schmidt Peterson Motorsports, 391; 8, Graham Rahal, Rahal Letterman Lanigan Racing, 371; 9, James Hinchcliffe, Schmidt Peterson Motorsports, 353; 10, Sebastien Bourdais , Dale Coyne Racing, 334.